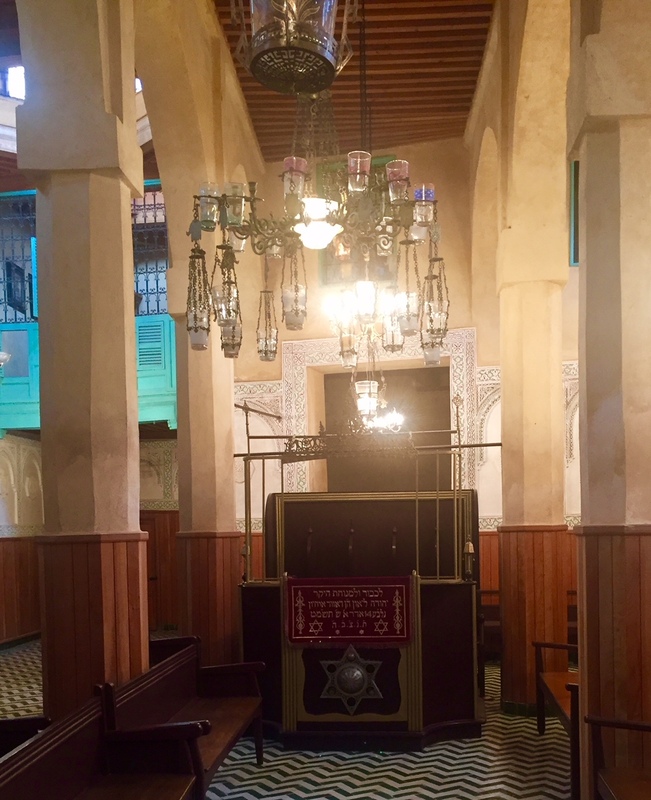 I took a whirlwind trip to Morocco just before Pesach that focused on visits to historic Jewish sites and spending time with remaining Jewish communities. 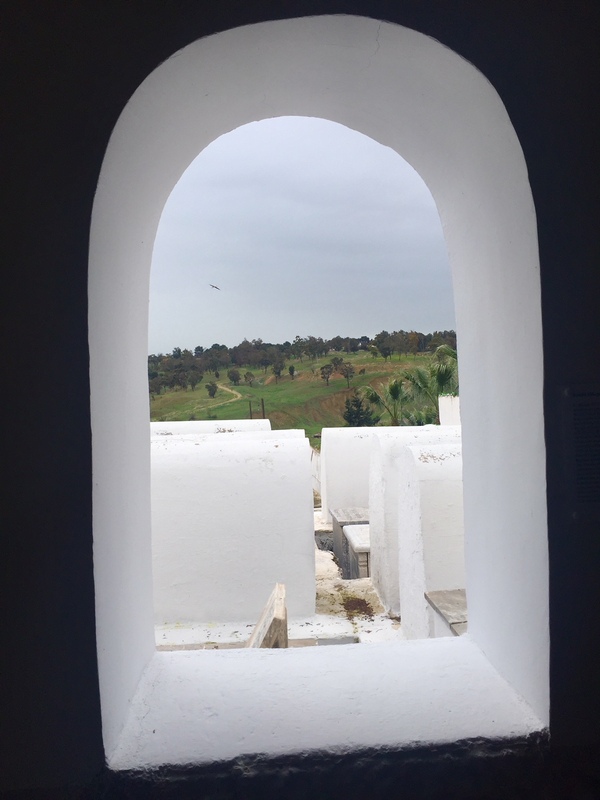 The 2,000 year history of Jews in Morocco is evident everywhere–from Jewish areas of towns (mellahs), to cemeteries to synagogues–and I grappled with the simultaneous historical nature of the trip along with immersing myself in dwindling communities. I traveled with a friend who is fluent in French (a bonus since I last spoke French my first year of college and rarely anyone speaks English). It was a chaotic start to our trip with missed flights, lost luggage and a bad hotel. But, we set out to track down these people and places without a proper guide, which was not always an easy feat. Through a contact my friend had in Israel along with some rabbis she met on her flight, our paper trail began to unfold. 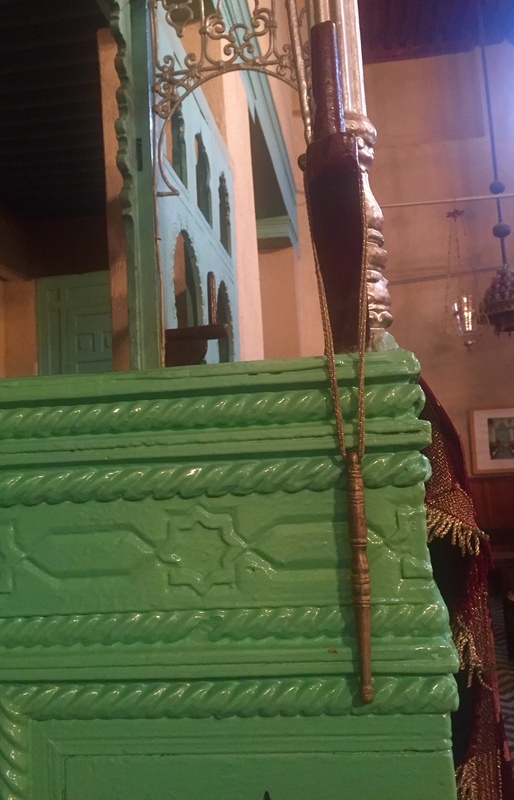 Most importantly, we planned to spend Shabbat in Fes (Fassis is what people in Fes are called) and a connection to “the butcher” there ensured we were with the community. While the butcher’s French was sparse, we were able to “order” our Shabbat meals through him, not exactly knowing what this meant or to expect (especially since I requested only vegetables, a strange concept to the butcher), and get some vague directions to the synagogue. When we finally found the Fes shul in the new part of the city on Shabbat evening, it turned out to be up a steep staircase, above a club. Despite the muffled thumping from below, we entered into a quite, ornately decorated single room with endless dangling lamps, intricately carved colorful walls and a band of colored windows. 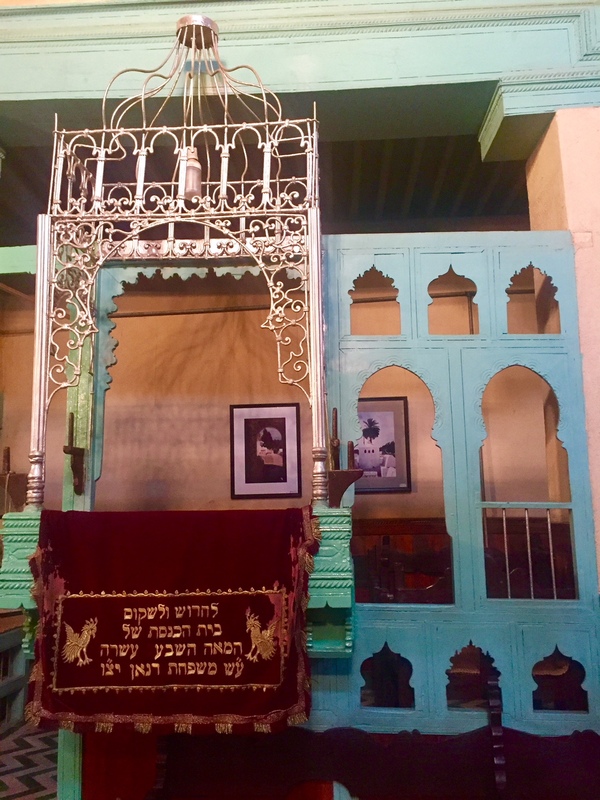 It was filled with wooden benches and a temporary bookcase served as a mechitza between the men and women (the curtain was being cleaned for Passover). The bookcase had a piece of paper taped to it that listed the names of each of the 32 members of the Fes Jewish community. There were about a dozen men–mostly elderly- scattered amongst the benches and singing Shabbat songs and prayers with as much gusto as their worn voices could muster. Shabbat lunch was at the Maimonides Center (at the site of the former Jewish school). The building was traditional Moroccan style with a large central courtyard lined with windowed rooms. 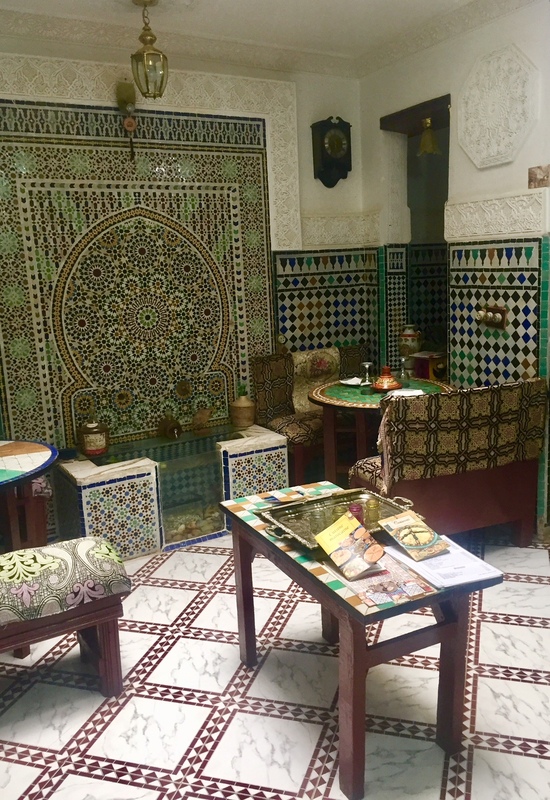 We sat in a large room with a tile floor lined with sofas, scattered with tables and photos of visiting dignitaries including the King of Moroccan and Prince Charles hung from the walls. A table for about a dozen people was laid out for lunch and the butcher (whom I now realized was also the chef and meal organizer) and an assistant brought endless little plates of salads. The few of us there sat down to eat–the rest of the table was empty until others arrived about an hour or two later. It was a long meal. We ate salads for at least an hour before we made the blessing over the bread (I like this Moroccan practice). The salads including matbucha, a potato dish, olives, meats, avocado with lemon, and spicy carrots. Each person would dip their fork in to take a single piece of the food and directly eat it after saying a blessing rather than creating a little pile on one’s own plate of all of the foods. It slowed the eating process down a lot. Eventually motzi was made over the bread, which was extremely large fluffy breads (imagine massive pita) and the main dishes (meat) were served while I made do with some rice. Throughout, people continued to trickle in and say their own blessings, depending on where we were in the meal. 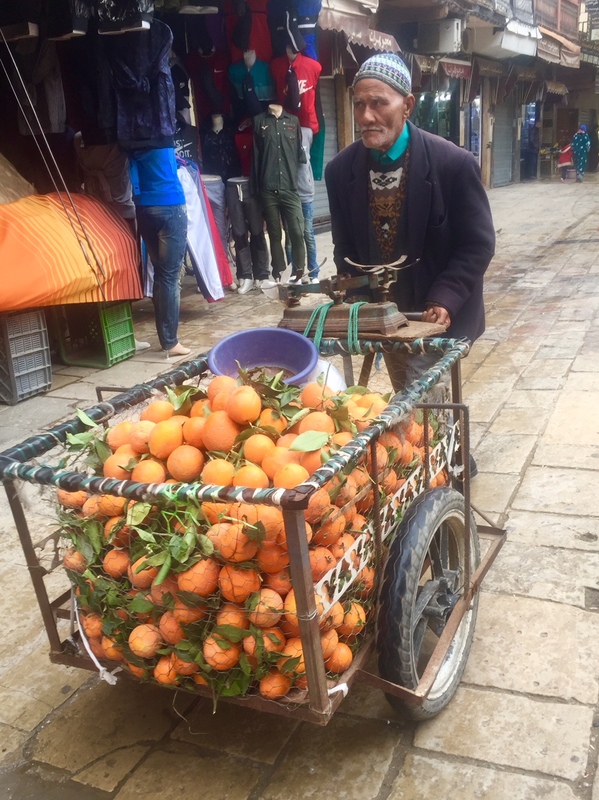 Throughout Morocco, people served fresh fruits as dessert and which was wonderful (especially oranges as they were everywhere). Just simple fruit on a platter with a knife. There was also a jellied grapefruit served at Shabbat lunch that was incredible. It was incredibly sweet with a touch of citrus tanginess and it was a deep orange color that belied it being a grapefuit. The conversation was mostly in French at lunch while some spoke at times in Moroccan Arabic and a few spoke to me in English a bit. Even though I couldn’t communicate well, the dozen or so people were so inviting and welcoming. There was an elderly man whom I couldn’t communicate with but he had the happiest, most inviting smile and laugh. He had no desire to leave Morocco as he produced kosher wines (who knew?). I felt so comfortable and grounded after the chaotic, hurried nature of the trip. When we returned in the evening for services, the men were in their regular places enjoying cookies and tea. They prepared a little tray of drinks and treats for us to eat and later came by with a paper bag for us to take our remaining desserts with us to enjoy the rest of the week. A member of the community connected us with a guide who was not Jewish but loved Israel and had spent many years living there. We meandered with him as he spoke fluent Hebrew through the relatively straightforward, melah (the Jewish area whose homes, unlike Muslim ones, had balconies) to visit a cemetery and two synagogues, both of whom are looked after by a local Muslim woman. 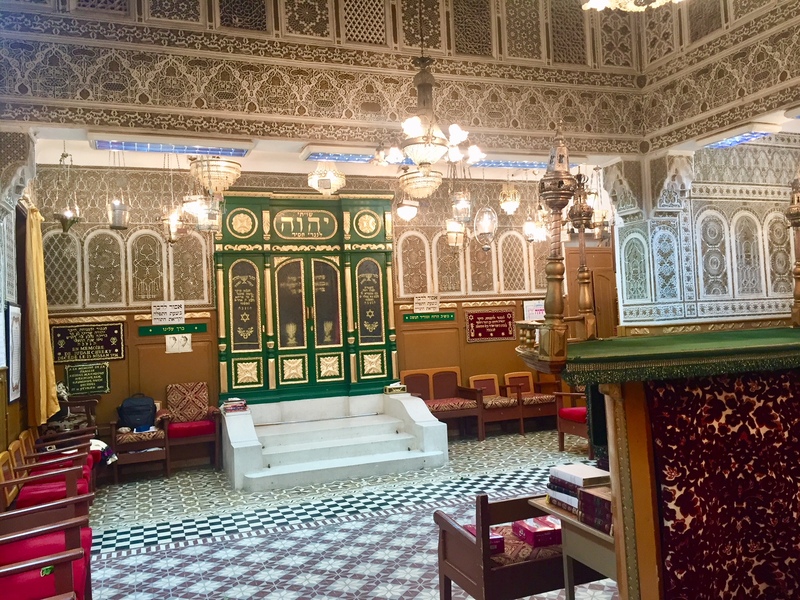 And then he led us through the winding labrynith of the thousands of year old medina of Fes, including a stop at a former home of Maimonides (which is now a cafe). 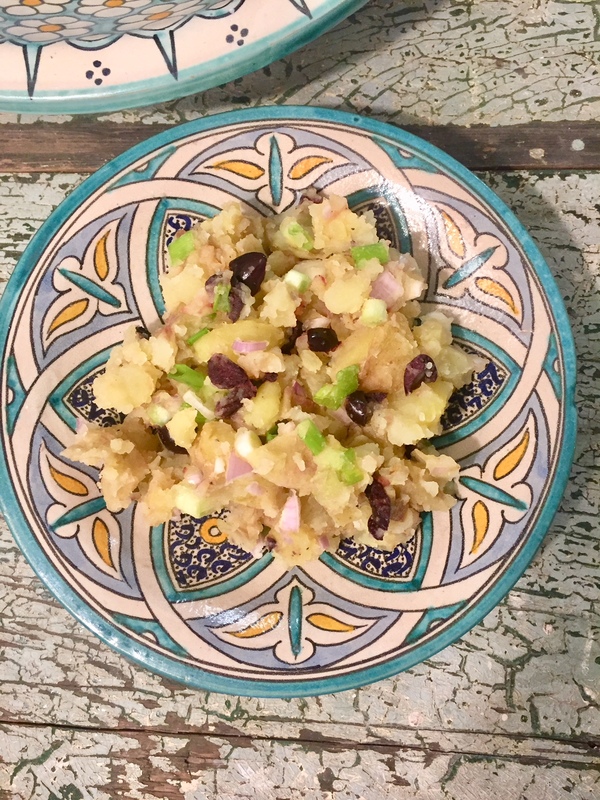 Since I already made matbucha, a classic Moroccan dish, in another post, I attempted to re-create the delicious, unusual potato dish that was served at the Shabbat lunch. 1. Scrub the potatoes, chop and add to boiling water. Cook until lightly soft, not mushy. 2. While the potatoes cook, chop the lemons, olives, scallions and shallots. 3. When finished, remove the potatoes from the water and let cool. 4. Add the remaining chopped ingredients. 5. Drizzle with olive oil, and add salt and pepper to taste. Mix well and serve. 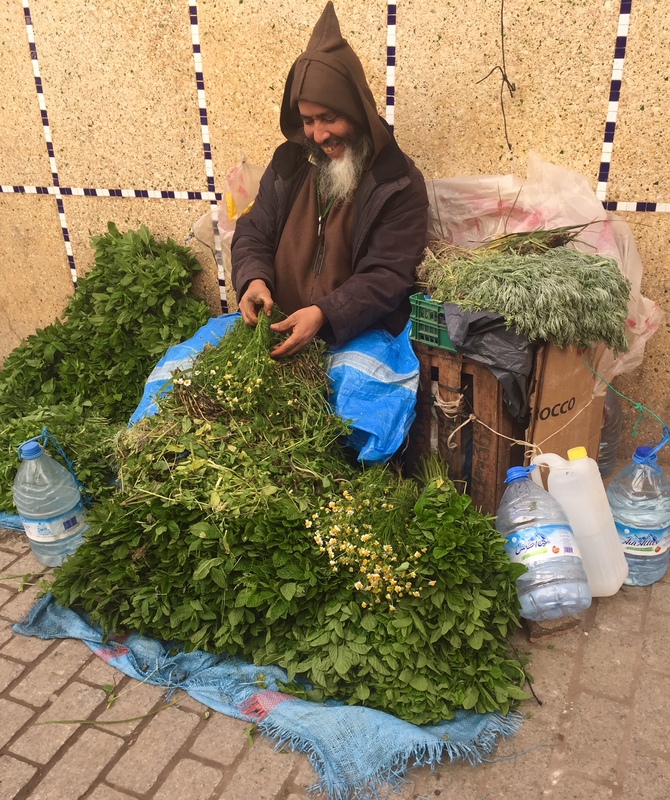 Man selling mint in Fes. This entry was posted in Side dish, Travel, vegetable and tagged community, cooking, Fes, Fez, food, Jewish, kosher, Moroccan Jews, Morocco, Shabbat, Travel by Sarah Newman. Bookmark the permalink. This looks very yummy. Despite (or perhaps because…) of my Ashkenazi shtetle roots, I’m game! Kept laughing out loud, remembering all our crazy adventures! Thanks for recreating them – and giving people a taste of the delicious meal we had 🙂 Beteyavon! Yes, my fellow Ashkenazi, I also agree!